With their unique sound and wonderful energy, Big Bang Blues is coming to have us dancing to their beat. We are totally jazzed about 30th of March, what about you? 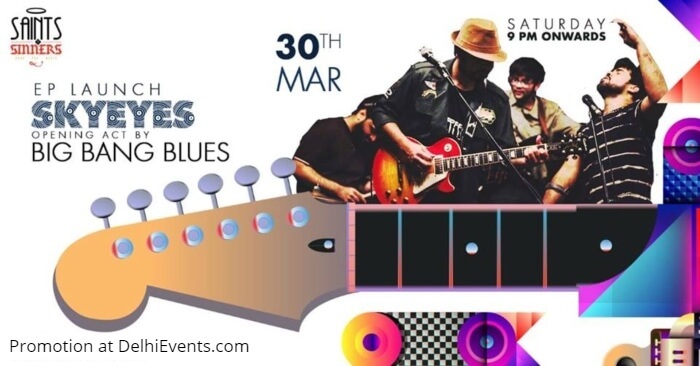 One of the country’s popular Blues acts, Big Bang Blues has a new avatar with that aims at exploring musicality beyond the Blues. SkyEyes has the same line-up as its popular sibling but an entirely new range of sounds that are showcased in their self-titled debut EP that released in February 2019. The EP has been mastered by John Davis and produced by Dan Swift, two legendary British sound-scapers, who’ve worked with international icons ranging from U2, Led Zeppelin, Prodigy, Pete Tong and REM to Snow Patrol, Aqualung & Kasabian among many others, respectively.